READING: Paris, My Sweet by Amy Thomas. This book is delightful as well as delectable. A love story dedicated to Paris, NYC and all things sweet from macarons to cupcakes to Angelina’s cocoa, this book is a must-read for any Francophile and sweet addict. And it’s a light read as well! WATCHING: J Edgar. Leonardo DiCaprio is amazing as always, supported by Judi Dench, Naomi Watts and Armie Hammer. But the movie felt too long at 2 hours and 20 minutes. There are several familiar faces peppered in between though, which makes the length a little bearable. Josh Lucas, Dermott Mulroney, Ed Westwick (Chuck Bass) Adam Driver (Adam from Girls) Jessica Hecht (Gretchen Schwartz from Breaking Bad, better known as Carol’s lesbian lover from Friends) and even Lea Thompson! The movie traces the life of J Edgar Hoover and how he built the FBI in detail, but it’s not the most entertaining. Watch it for Leo. LISTENING TO: Because by the Beatles. ENJOYING: My new Coup Card! Can’t wait to head to my favourite pastry shop tomorrow for macarons. 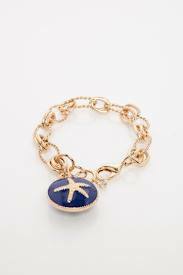 LOVING: This nautical starfish bracelet from Sosie.